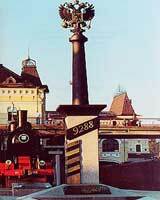 The town of the Trans siberian railroad. Stop along the way. Trip to Transiberian raiload. Tour to Transsib. Trans Sib. Trans Siberian Route Description. The town of the Trans siberian railroad. Stop along the way. Trip to Transiberian raiload. Tour to Transsib. Trans Sib. There's something special about watching thousands of kilometers passing by, and observing ever-changing landscapes and views through the window of your train. Despite all the books, games, and diaries you will have taken with you, most of the journey will be about getting back to the origins of life. You will eat and sleep all days through. You will feel the pleasure of pure biological life again. The philosophical question of what to eat first - either “pirozhki” (cakes) bought from an old lady at a station, or hard boiled eggs presented by your neighbor - will be the most important to solve for six days. And this peculiar, magnificent, and expanding feeling of freedom when you are rushing to the platform to have a five-minute solid ground brake after the endless hours of life-on-board. Your compartment may become your second house after two days spent in the train. However, to really liven up your experience, travel company "Legend tour" recommend you to make a few stops along the Trans-Siberian. 0h 0m The capital of Russia. A vibrant historical center. 2h 30m A small ancient city along the Golden Ring. 6h 30m A big vibrant industrial center of Volga region (Povolzhie). The end of Nizhegorodskaya region, start of Kirov region. 11h 20m Here Trans-Siberian meets with the old track that was going through Yaroslavl. 12h 50m A small industrial northern city. Center of Kirov region. The end of Udmurtiya republic, start of Perm region. Start of Urals region. 20h 10m A big industrial town in the beginning of Ural mountains. The main attractions are a few museums in the city, and old prehistorical caves. 1d 2h 20m Ekaterinburg was founded in 1797, and now it is the unofficial capital of Ural region — the most industrial (and polluted) region of Russia. However, Urals are most known as the mountains that divide Europe and Asia. Ekaterinburg itself is a nice and real (unvarnished) industrial city of modern Russia with many interesting buildings and sights. The end of Sverdlovsk region, start of Tyumen region (2070 km). The end of Ural, start of Western Siberia. The center of Tyumen region — the oil & gas center of Russia. The end of Tyumen region, start of Omsk region. The closest place to Kazakhstan of the route: about 100 km. The end of Omsk region, start of Novosibirsk region. 1d 21h 30m The biggest city in Siberia region with 1442000 inhabitants, it was founded in 1893. Novosibirsk is the third main cultural and scientific center in Russia (after Moscow and St. Petersburg), the university of Novosibirsk is quite famous too. The city is developing quite rapidly, and is considered to be the capital of Siberia. The area around Novosibirsk is very good for camping and trekking. Besides, Novosibirsk is a great place to start discovering Altai mountains, which are not far. The end of Kemerovo region, start of Krasnoyarsk region. 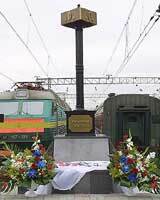 2d 9h 20m If you have a goal to stop at all the main Trans-Siberian stations, then you should stop in Krasnoyarsk, which is an important Siberian industrial center. But frankly, we personally find there's nothing interesting, except for Stolby National Park, which is outside of the city. 2d 14h 0m There's a nice market at the station - eggs, potatoes, fish, sausages, tomatoes, ice cream, salted cucumbers, fresh stuff. Train stays 20 mins usually. The end of Krasnoyarsk region, start of Irkutsk region. 2d 16h 30m Here you can change to BAM train line. Check beforehand if there's a train. 2d 19h 20m Shops with beer, babushkas sell food in big bags - they walk with their bags and they open the bags to show you what is inside (there it looks like they're hiding). The air is warm and there are many mosquitoes. 2d 23h 10m A weird place with very hot climate in summer. 3d 2h 20m All the chemical and machinery productions are concentrated in this city. It was built by prisoners, so the landscapes are not very welcoming. Also, it is considered to be quite dangerous. 3d 3h 20m Irkutsk is a nice city with unusual atmosphere and interesting architecture. Baikal lake is just 60 kilometers away, and there are also Sayan mountain range quite close. Irkutsk is a good starting point for various outdoor activities and for exploring the western side of the lake Baikal. A truly amazing and beautiful lake. There are a lot of places to enjoy pristine nature, and swim in the lake. It is worth making the Trans-Siberian just because of this lake only. Spend a few days there and you'll feel as if you were born again. You can either go there by yourself, or join in various outdoor activities offered by tour operators. 3d 5h 50m A village on the shore of Baikal. It's more like a port, so it's not interesting to stay in there. 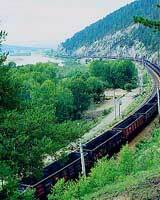 It is a good starting point for exploration of Circum Baikal railway (which starts there), or going south to Arshan (3 hours), which is just next to Sayan mountains — a great place for camping, walks, and various activities. By the way, you can buy great smoked fish from Baikal lake - Omul - there. Highly recommended. The end of Irkutsk region, start of Buryatia republic. 3d 12h 20m Overlooked by many travelers, this is a great place to stop for a few days (or even weeks - for Baikal). Ulan-Ude is the first place along the Trans-Siberian, where you feel like you're in Asia finally (after more than 2 days travel in the Asian part of Russia!). It has a feel of a calm, friendly Asian town (quite close to Mongolia, in fact), and there are a lot of interesting things to discover. Start with a local History Museum, visit a Buddhist Datsan, go to the open-air Ethnographic museum, and then go on to explore the Eastern shore of Baikal lake, which is much less tourist than the opposite Irkutsk side. In Ulan-Ude the Trans-Siberian splits into two directions: to the south through Gusinoye Ozero, Djida, Naushki (Russia) to Ulan-Bataar (Mongolia) to Beijing (China) - Trans-Mongolian, and to the east through Chita to Vladivostok (Trans-Siberian). 3d 21h 50m. The center of Chita region. A big industrial city. 100 km after Chita (in Karymskaya) the Trans-Siberian splits into two routes: to the east to Vladivostok, to the south through Manchuria to China (Trans-Manchurian). Below the Eastern route to Vladivostok is shown. The end of Chita region, start of Amurskaya region. 4d 19h 40m. A few kilometers before Skovorodino there's a train line to BAM (Tynda). Crossing Amur river via the longest Trans-Siberian bridge - 2612 meters. After - a long tunnel. 5d 15h 40m. A city, which is located on Amur river, China is just on the other shore. A nice and friendly town, and an important break from the train journey as well. 6d 5h 19m. The last stop of Trans-Siberian. In the 1860, an army squad landed on the bank of Zolotoy Rog (Golden Horn) bay and built the barracks, it was the first building in the Vladivostok. Soon after that Vladivostok became the main Russian port on the Pacific ocean. If you travel on Trans Siberian from the east to the west (Vladivostok -Moscow or Beijing - Ulaanbaatar - Irkutsk - Moscow) you also can make stops on these cities. You also can look Moscow, Saint Petersburg and then to go home. Electronic tickets are only available for Russian domestic trains. If you are traveling outside Russia, we will need to issue a paper train ticket and mail it to you.